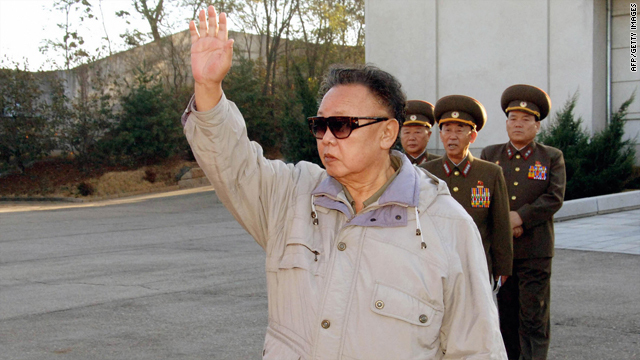 (CNN) -- North Korean leader Kim Jong-il is believed to be in China, according to the South Korean news agency Yonhap. Quoting unnamed sources in Seoul and Beijing, Yonhap said Kim is believed to have arrived in the Chinese border city of Dandong early Monday by train and to be heading to the port city of Dalian. The South Korean government was trying to confirm details, Yonhap said. A visit by Kim to China has long been anticipated in Seoul and Washington, according to Yonhap, with the hope that the visit would be followed by a North Korean announcement that it would be returning to the so-called six-party talks on denuclearization. Kim, who is said to be afraid of flying, has visited China four times since 2000, by train only, according to Yonhap. The North has said it will not return to the nuclear negotiations until the removal of the U.N. sanctions and the start of discussions for a peace treaty on the Korean Peninsula. Meanwhile, there are suspicions in South Korea that the North may be behind the sinking of a South Korean warship on March 26 that killed 46 South Korean sailors. South Korean Foreign Minister Yu Myung-hwan earlier said his country will oppose resuming the nuclear negotiations if the communist North is found to have been involved in the sinking of the 1,200-ton warship, Cheonan, because the North "must be made to pay for its actions," according to Yonhap. The nuclear talks, involving both South and North Korea, the United States, Japan, China and Russia, were last held in December 2008.